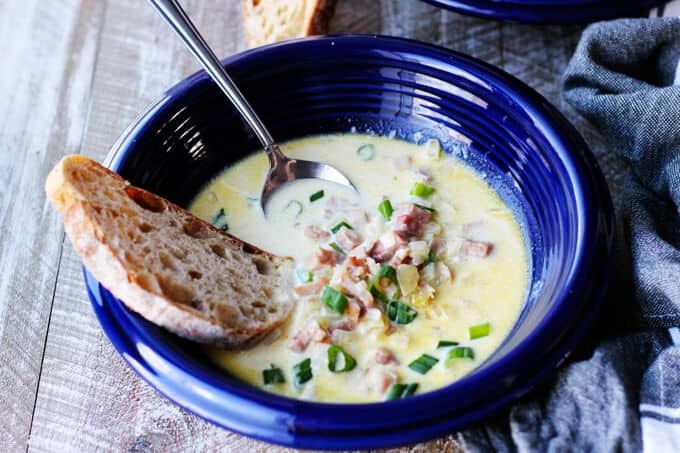 This Ham and Cheese Soup with White Wine and Gruyere is a great recipe to show you how easily you can repurpose your leftover ham (from Easter or other fancy dinners). This soup is rich and decadent, and it will keep your loved ones coming back for seconds…guaranteed. This post was originally published on March 23, 2018, and since then it was updated to provide additional information. 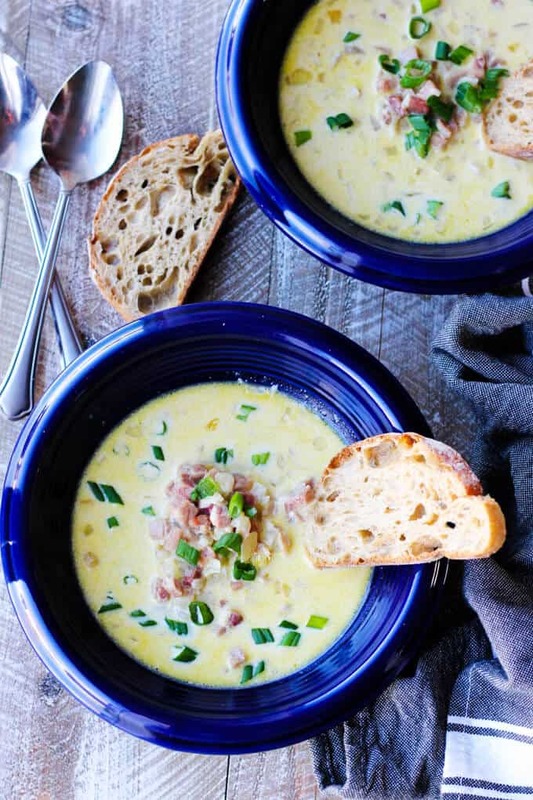 What’s the Secret to this Ham and Cheese Soup? I remember the first time that I ate cheese soup back in Poland; I was so amazed by the taste and consistency. I immediately desired to recreate this recipe. After a bit of trial and error, I figured that there actually was a secret ingredient to make this smooth consistency: spreadable cheese in addition to Gruyere. The spreadable cheese found throughout Europe is extremely soft and it melts easily. Here in the U.S., the only one that’s commonly available is Laughing Cow. I used 2 little triangles here (in addition to Gruyere), but it took a while to melt. Should you have any Polish specialty store near you, I suggest you pick up a spreadable cheese there and use it for this recipe (see recipe notes for this information). On the topic of cheese, you should know that spreadable cheese is actually optional as it is not easily accessible. Gruyere is actually best and sufficient here. 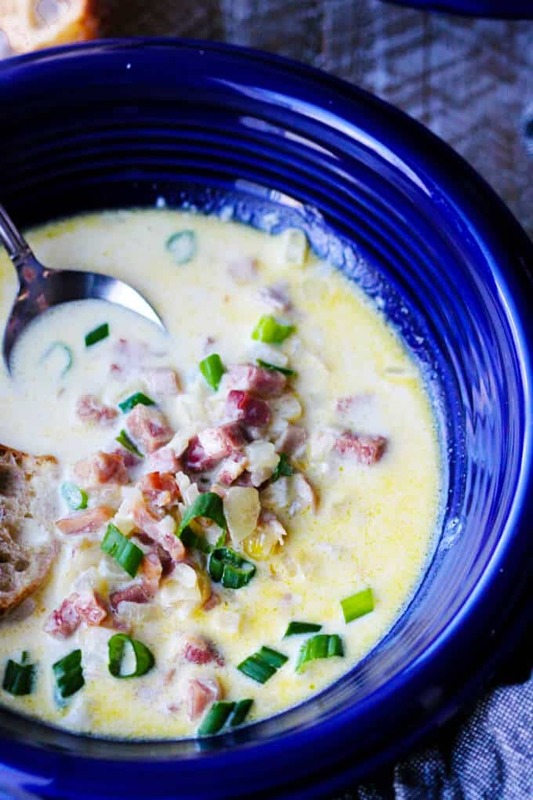 Your Ham and Cheese Soup will be cheesy and delicious. 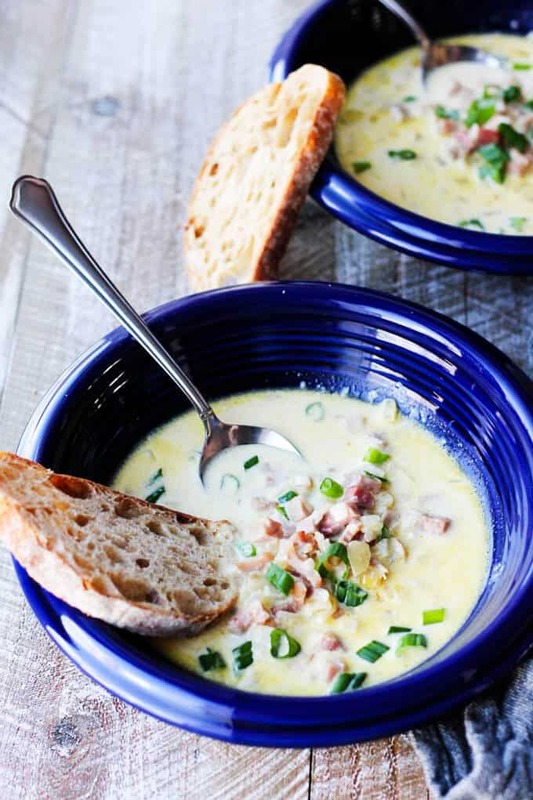 Make this Ham and Cheese Soup Using Your Easter Ham Leftovers. 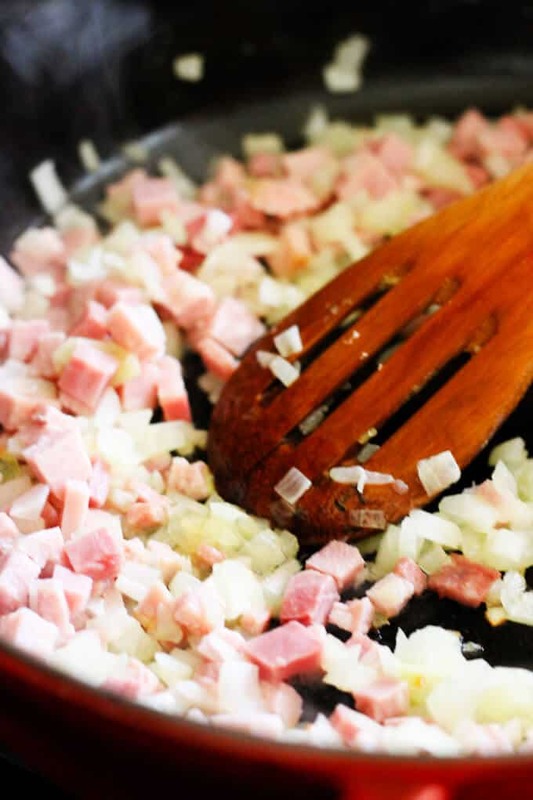 Speaking of ham, don’t you usually end up with lots of leftover ham after Easter? I do. And my husband doesn’t like to eat the same meal twice, so I always try to find new ways to use my leftovers. Crepes with Egg, Ham, and Cheese. 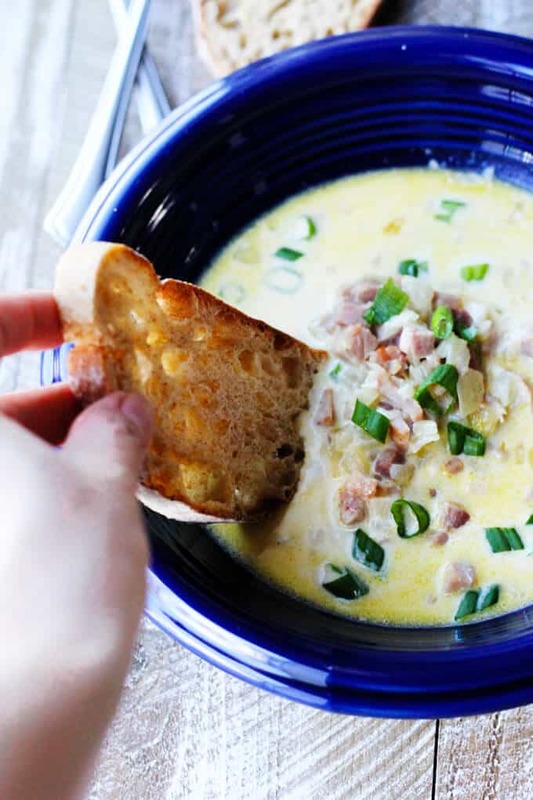 What Ingredients Are Needed to Make This Ham and Cheese Soup? Cheese soups are so big in Europe. Different countries have their own versions. For instance, Germany adds beer to their cheese soup. For this version, I decided to go with more of a French style and added white wine (it was an excellent decision). The tanginess from the wine helped balance the heaviness from the cheese. I also decided to keep my soup rather thin, as we ate it with bread. But you can make it thick with a little bit of flour (check the recipe notes for this version). You can also serve it with croutons – you can use this recipe for Greek Panzanella Salad to see how I made croutons. I must say this is by far the best cheese soup I’ve ever eaten. When I made it, I gave my husband a taste, he looked at me with this look at his face and said “oooh….that’s good.” I dare you. Try and let me know! 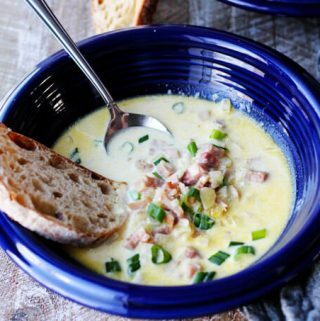 This Ham and Cheese Soup with White Wine and Gruyere is yet another recipe to show you how easily you can repurpose your leftover ham. This soup is rich and decadent, and it will keep your loved ones coming back for seconds...guaranteed. 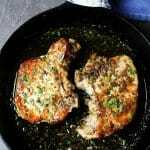 In a Dutch oven or other heavy pot, melt the butter and add onions. Cook for 2 minutes until translucent. Add ham and cook for another 2 minutes. Add white wine and let reduce in half for a minute or two. 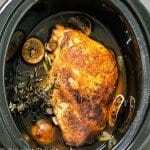 Add chicken stock, cover the pot and cook for 15 minutes. Add one cup of cream and cook for a few more minutes. If using spreadable cheese, melt them in a cup of hot water and add to the soup. Turn off the heat and add gruyere, nutmeg, and black pepper. Serve with fresh scallion or chives, bread on a side or toasted croutons. **If you want your soup thicker, mix 1 tablespoon of all-purpose flour with water and add to the broth. Let cook for a minute. ***If you want to serve your soup with croutons, check my recipe for Greek Panzanella Salad when I show you how to make croutons. What a great idea. White wine and Gruyere are a beautiful combination. I was familiar with Beer Cheese Soup (with Cheddar), but I hadn’t heard of this before. Thanks. Thank you so much Bernard! 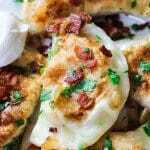 This sounds so delicious – I don’t think I’ve ever had white wine and Gruyere together – other than on crackers (the cheese not the wine but you get ma drift) and this sounds so comforting – fantastic recipe – thanks so much for sharing! I never thought I would describe a ham and cheese soup as elegant, but the designation is fitting! White wine and gruyere cheese really elevates this dish. Thank you so much Traci. I hope you will like it!